Published: Feb. 14, 2013 at 02:47 p.m. 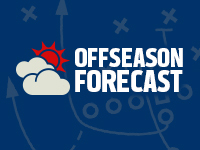 Updated: Feb. 14, 2013 at 07:41 p.m.
With the offseason officially underway, Around the League will examine what's next for all 32 teams. The series continues with the San Diego Chargers. A better question is "what's not changing?" The San Diego Chargers finally blew up the tag-team of general manager A.J. Smith and head coach Norv Turner, replacing them with ex-Indianapolis Colts executive Tom Telesco and former Denver Broncos offensive coordinator Mike McCoy. Ex-Arizona Cardinals coach Ken Whisenhunt will take over play-calling duties as the offensive boss. McCoy and Whisenhunt both cited the opportunity to work with quarterback Philip Rivers as a primary reason for landing in San Diego. John Pagano stays on as defensive coordinator, though he will be charged with overseeing a rebuilding effort. » RG Louis Vasquez: The one bulwark on an offensive line decimated by injuries and ineffectiveness, Vasquez is highly regarded by NFL scouts. Turning 26 this offseason, he will join the Buffalo Bills' Andy Levitre as the top guards on the market. » CBs Quentin Jammer/Antoine Cason: Clearly in the decline phase of a rock-solid career at age 33, Jammer is coming off his second consecutive subpar season. Cason struggled in coverage at times, but came on strong at the end of the season. He could command as much as $5 million per year on the open market. » OLB Shaun Phillips: Turning 32 in May, Phillips is nearing the end of the line after racking up 69.5 sacks in nine seasons with the Bolts. With San Diego's minimal salary-cap space, he could join former coach Norv Turner in Cleveland while easing the transition to Ray Horton's 3-4 defense. 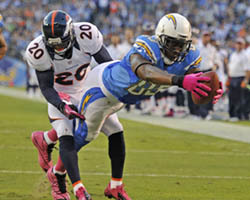 Take a look at the best photos from the San Diego Chargers 2012 season. Other key free agents: LG Tyronne Green, DE Vaughn Martin, DT Aubrayo Franklin, RB Ronnie Brown, K Nick Novak. The No. 1 priority is overhauling an offensive line that had Rivers under pressure throughout the 2012 season. Both guard spots and left tackle must be addressed in the next couple of months. Tailback depth is a concern with Ryan Mathews coming off surgeries to both clavicles in the past eight months. The defense has promising talent up front, but needs an infusion of youth at linebacker and in the secondary. Eight starters are due to reach unrestricted free agency; the majority will be moving on. Restricted free agent Danario Alexander will likely be retained via a first-round tender after emerging as Rivers' go-to receiver in the second half of the season. The Chargers can't afford to dump free-agent bust Robert Meachem, as his $5 million salary is fully guaranteed and would count $10.625 million against the cap if the receiver was released. Left tackle Jared Gaither is a poor bet to return after alienating teammates with his reported malingering in 2012. Expect early-round draft picks or veteran free-agent additions at tackle, guard, and cornerback.